There is a connection between Emotion, Sound and Raga (melody). The last bhajan that was sung had the Jogiya Raga. You cannot associate this raga to Radha. If you say, ‘Shiva, Shiva’, it can be associated with the Raga of dispassion. Once somebody was invited to a marriage reception and was requested to sing. He started to sing (in Kannada), ’Why did you leave the body and go, dear soul? Is this death justified?’ Does this song suit the occasion? You cannot sing any song anywhere. The Emotion and Raga must match. You cannot sing any song anywhere. The Emotion and Raga must match. So, if you don’t step on the emotion of a woman, everything will be fine. Now for both of you – Don’t ask proof of the other person’s love for you. Don’t ask, ’Do you really love me?’ Never give the burden to someone to prove his or her love for you. Do you see what I am saying? If you find their love for you is less, you should say, ’Why do you love me so much?’ Don’t say, ’You don’t love me’, and things like that. Q: If someone provokes us, should we keep quiet or teach them a lesson? If we keep quiet then they consider it as a weakness, and if we teach them a lesson, they say that we have not grown spiritually. Sri Sri Ravi Shankar: To teach someone a lesson, you should be calm. If you have anger, if you are disturbed, you cannot teach someone a lesson. At the same time, you cannot keep turning the other cheek all the time. Teach the lesson, but with compassion. This will give you strength. When you have understood the position of a person and why they are provoking you, you will deal with them with a calm and serene mind. 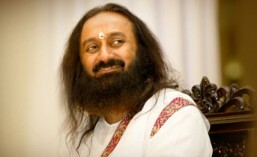 Sri Sri Ravi Shankar: First of all, know that nobody can constantly spread negativity. Second, deal with it with skill.